For best results ‘chit’ (encourage to sprout ) potatoes prior to planting. Stand the potatoes in egg trays blunt end uppermost. Potatoes are ready to plant when shoots are half to one inch long. Use a container with enough room for 10 litres volume per tuber. Fill a quarter of the pot with compost and plant the chitted potatoes near the bottom of the pot. As the plant grows, keep topping up the compost. If placing tubs outside, protect from frost. Protect from frost by covering with fleece. Leeks, carrots calabrese, cauliflower, peas, cabbage and kale are amongst vegetables that can be planted directly into the ground. Runner beans, French beans, tomatoes and cucumbers can be planted under cover. 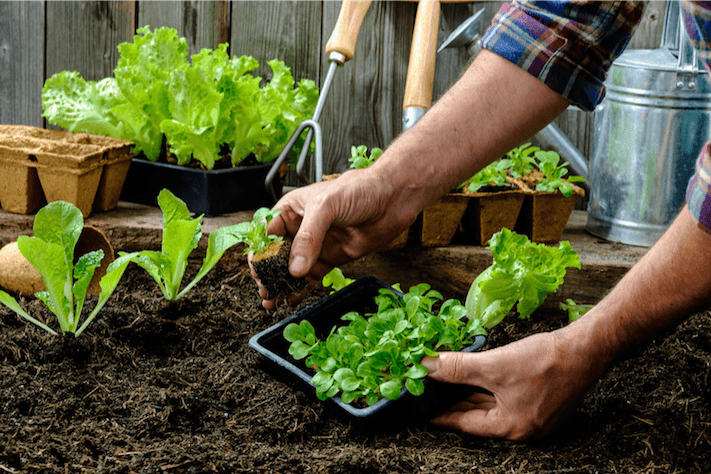 Spring is a good time to plant, the soil is warming up and is still moist. Make a planting hole bigger than the root ball. Add compost and slow release fertiliser to help the plant to become established. Ensure the plant is at the same level as it was in the pot. Firm the compost and water in. For bigger leaves and better colour, cut back Sambucus and Cotinus to just above the base. Apply slow release fertilizer such as Growmore, to borders and hedges to feed plants over the growing season. Either sow in situ or in modules in a cold greenhouse. When transplanting, be careful not to disturb the roots. Weed and feed lawns. Lawns have suffered over the long wet winter. Replace lost nutrients with a general lawn feed or treat them to a weed feed and moss kill.